Squamous cell carcinoma (SCC) is a type of tumor that arises from skin cells and the cells that line the eyelids, oral cavity, and other areas of the body exposed to the outside world. 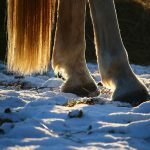 It is the second most common type of cancer in horses and can affect the eyelids, the whites of the eye, or the cornea (the clear window at the front of the eye). SCC does not metastasize (spread to distant parts of the body) very often, but it can be very destructive locally and will sometimes spread to local lymph nodes and other nearby structures. SCC can lead to loss of the eye, and some horses are eventually euthanized due to the spread of disease. SCC most commonly has a “cauliflower” or “cobblestone” appearance, but in its early stages it can appear as a small area of pigment loss, crusting, ulceration, or irritation on or around the eye. 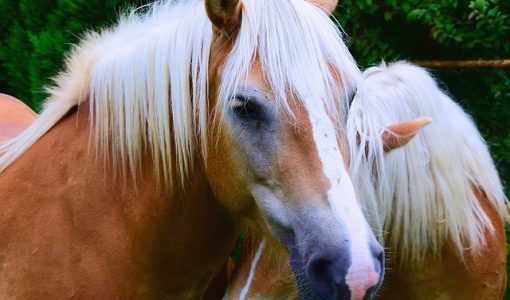 Horses who lack pigment on their eyelids and around the eye are at more risk. Belgians and Haflingers also seem to be highly predisposed to developing SCC. It is thought that a genetic mutation may play a role in those breeds. UV light exposure (sunlight exposure) may trigger the development of these tumors. 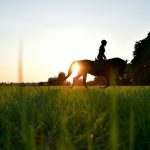 What can you do to protect your horse from SCC? To start, you should familiarize yourself with the appearance of your horse’s eyes and eyelids. Inspect him or her once a week for any changes, and call your veterinarian if you notice anything, even a minor change. Lightly pigmented horses should wear a UV-blocking fly mask when turned out, and you should try to avoid turnout during midday when the sun is strongest. SCC is easiest to treat when tumors are small. 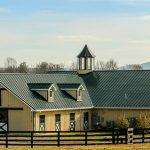 For small lesions, your veterinarian may be able to perform surgery at the barn. For larger tumors, or for tumors that affect the eyeball itself, a board-certified veterinary ophthalmologist can combine surgical treatment with cryotherapy, CO2 laser treatment, chemotherapy, or other options to limit the risk of recurrence. Outcomes can be excellent with early, aggressive treatment. The ophthalmology team at Cummings Veterinary Medical Center offers a full range of treatment options for SCC. 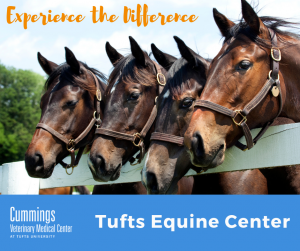 We work in conjunction with our large animal anesthesia and internal medicine groups to offer complete care for your horse while he or she is at the Hospital for Large Animals. In many cases, we are able to offer same-day or next-day surgery to limit the need for multiple trips back and forth with your horse. We also support our colleagues around the country by facilitating sample submission for genetic and other studies regarding this disease. 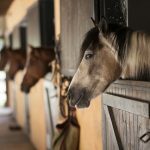 If you are concerned about your horse’s eyes, schedule an appointment with your veterinarian. He or she is welcome to call us with questions or to set up a referral.